who share a passion for the game of chess. to our meetings for lessons and game analysis. are our only requirements for membership. If you think you are beaten - you are. If you think you dare not - you don't. 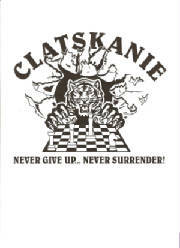 The Clatskanie Chess Club does not discriminate based on the basis of religion, race, color, gender, national origin, sexual orientation, age or disability. We won't stop giving all we got!